Ryan N. Gajarawala Ashrita Furman demonstrates his ability to extinguish blowtorches using only his tongue, a skill he used to break the previous Guinness World Record. The floor around a stepladder in Ticknor Lounge is strewn with marshmallows and chunks of apple. 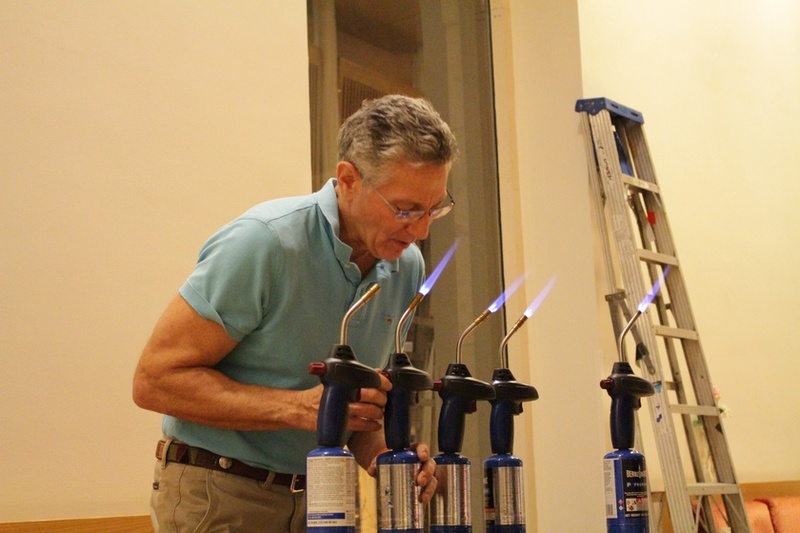 Several blowtorches grace a table like so many vases. A pogo stick leans against an upholstered bench, in front of which stands another table holding a milk bottle full of water, a bowl of apples that have escaped the fate of their sliced peers, and a samurai sword. This debris is left over from a presentation by Ashrita Furman, the man who holds the world record for breaking Guinness world records. He has set more than 700 official records and currently holds over 200. 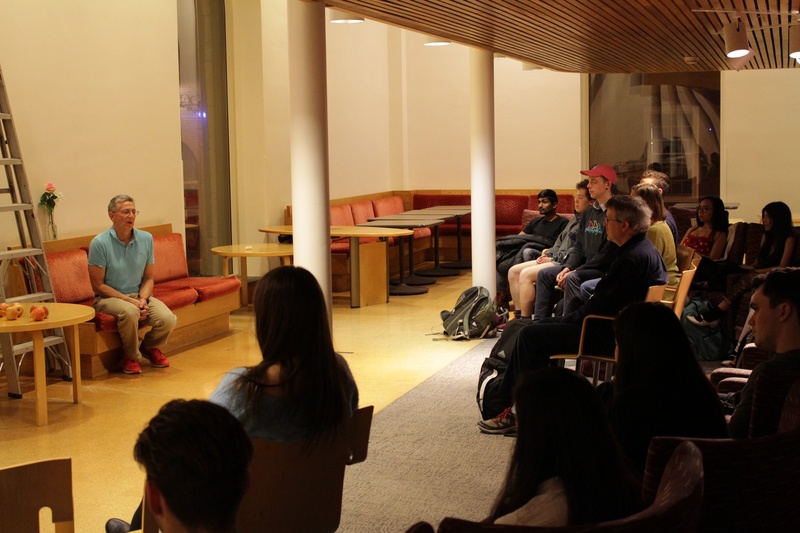 During his presentation on April 3 in Harvard’s Boylston Hall, Furman began by introducing his philosophy, which centers around the search for happiness and the practice of meditation. No sooner had he finished this preamble than he began to skip across the stage. Mid-hop, Furman explained to the crowd that he believes skipping expresses the kind of childish fun we begin to lose with age. He proceeded to recount that he once skipped an entire marathon. Furman’s talk combined his personal idiosyncrasies with more conventional forms of spiritualism. For instance, after putting out six blowtorches with his mouth (“you can hear the sizzle of your tongue every time it hits the metal”) and briefly noting the times he pogo-sticked underwater, in Antarctica, and up Toronto’s CN tower, he led the audience through a series of chanting, concentration, and visualization exercises. After balancing a step-ladder on his chin, still out of breath, he began coaching techniques to quiet the mind. Upon his request, the crowd chanted an eerily drawn-out rendition of the syllables “gra-ti-tude,” while passersby looked in quizzically though the tall windows of Ticknor lounge. Some of Furman’s corporeal feats verged on the culinary. At one point, he invited up a friend, the mononymic “Bipin,” who proceeded to launch marshmallows, with astounding aim, towards Furman’s mouth. A few rounds in, Furman spit out a marshmallow to observe, “I’m missing a lot of them,” but quickly picked up the slack. Furman also recounted his journey with samurai practice, which he took up in an attempt to break the record of most apples samurai-sword-sliced in under a minute. This story, of course, did not pass unaccompanied by a duly gripping demonstration. Furman lives for breaking the records of a book that was conceived just a few days before he was born. The idea for Guinness World Records appeared in the early 1950s as a promotional scheme for Guinness Brewery. According to the Guinness World Records’ official website, Sir Hugh Beaver, the brewery’s managing director at the time, once got into an argument about the fastest game bird in Europe, and, finding no satisfactory answer, became convinced of the necessity of compiling a book of facts to settle disputes in pubs. In his youth, Furman became obsessed with what had become the beer company’s compilation of bizarre competitive feats. At 16, Furman met a meditation teacher, Sri Chinmoy, in his hometown of Queens, New York, who emphasized physical excellence as a means of transcendence. Since then, Furman has applied Chinmoy’s mind-over-body doctrine and emphasis on athleticism to achieve record-breaking feats. As he cleaned up the remnants of his presentation, Furman spoke to Fifteen Minutes about all things superlative and spiritual. When asked which of his broken records he felt the strongest about, he recapped a story he had told during the event. “I was going to do forward rolls along Paul Revere's ride, which is 12 and a quarter miles.” When breaking a Guinness record, he explained, the activity must be continuous, with one exception: “You're allowed to stop to throw up — it's the only time you're allowed to stop.” Furman admitted that he succumbed to this exemption many times on the forward-roll ride; somewhere along the way, he decided he would stop at the 10-mile point, just enough to break the existing record. “People magazine was following me, it was being broadcast on the radio, and a furniture store along the route heard about me... They put out this big La-Z-Boy chair right in front of the store, which was just past... the 10 mile point,” he remembers. “It was like seeing an oasis in the desert.” But when he approached the chair, a friend who was with him phoned Sri Chinmoy, who instructed him to urge Furman to finish. After a split-second in the La-Z-Boy, Furman obeyed — he got back up and found himself speaking a chant he had never heard before. “I am not the body, I am the soul,” he repeated, and he went on to finish the entire route. Despite the record book’s emphasis on quantification and publication, Furman maintains that his motivations are not material. “I mean, I don't care about, you know, getting in the book. It's all about having these experiences of transcending your limitations — like, really pushing past where you think is possible.” That the mantra came to Furman after his 10.5-hour forward roll foray perfectly elucidates this mind-over-body philosophy. But Furman’s insistence that he does not care about entering the annals of the beer company’s fact almanac renders his methodology mystifying: The way he transcends his own limitations is specifically by surpassing the limits of others as catalogued in the book. Yet, in doing so, he seems to have found an enviable happiness. “The ironic part about that is I did not get the lottery — so I was very unhappy because of it,” he recalled. Shu also seemed to feel a personal affinity for the presenter’s mode of achievement, reminiscing on his own attempts at “Guinnessport” (the technical term for the undertaking of challenges with the express purpose of breaking a world record). Over a dull middle school summer, Shu decided that he was “going to try to find the easiest world record to break.” He discovered the perfect challenge: “longest paperclip chain made in 30 seconds.” After weeks of practice and one fraught disqualification (he had stepped out of frame in his video and was consequently deprived of his title by a vigilant whistle-blower), he succeeded in surpassing all other speedy paper clip connectors. A certificate from Guinness detailing his achievement still hangs on his bedroom wall. On the surface, one might align the achievement-seeking culture of Harvard students with Furman’s own desire to surpass predetermined marks of excellence. Did Shu’s paper clip connecting foreshadow his future academic ambitions? Perhaps, but what distinguishes a Harvard acceptance from a Guinness certificate is its practical significance: No employer looks for Guinness records on a resume. So maybe Furman’s pursuit of those particular marks of achievement truly does transcend the framework of social status and accepted forms of ambition. He has circumvented these tenets of adulthood in channeling his remarkable abilities not toward an athletic scholarship or Olympic medal, but towards the sort of goals Shu embraced as a child. Hence his belief in the childish joy of skipping. Furman was brought to Harvard by “The Giving Pledge,” a recently formed organization which helps students pledge a percentage of their post-grad salary to demonstrably effective charities of their choice. After Furman’s presentation, FM spoke to the project’s co-founders, Jadyn K. Broomfield ’21 and Andrew D. Zuckerman ’21, in the hopes of finding out what about their mission motivated them to invite Furman. One also might wonder, watching this presentation amongst a group of high-achieving, overstressed Harvard students, their backpack-laden peers darting past the windows, how to reconcile Furman’s sentiments with the incentives of the campus. The organizers emphasize Furman’s message of gratitude. “We've had certain opportunities that have given us this position of influence,” Broomfield comments. She and Zuckerman hope that by pledging to donate, students will show gratitude for what they have and derive happiness through helping others. Prior to the presentation, Shu — after relaying his paper-clip experience — had wondered how Furman might connect record breaking with personal happiness. It seems that the link, for Guiness Champion and Giving Pledge alike, lies in an active practice of gratitude.